You can barely count the number of campaigns for Call of Cthulhu set outside the classic period of the 1920s on the Great Old One’s tentacles, so the arrival of a campaign for Call of Cthulhu's newest setting is all the more welcome. Especially as it is the fourth release from Miskatonic River Press, the publisher of the well regarded New Tales of the Miskatonic Valley anthology and the modern-set, Mythos free campaign, Our Ladies of Sorrow. This new campaign is The Legacy of Arrius Lurco, written by Oscar Rios for the Cthulhu Invictus setting which explores the place of the Cthulhu Mythos in Ancient Rome. It presents a full four-part campaign against a Great Old One and his nefarious minions that takes the investigators from Rome itself, the heart of the empire to the provinces of Achaea (Greece) and Cyrenaica (Crete). The campaign is ostensibly set in the year 130 C.E. during the reign of the Emperor Hadrian, but much like the rest of the support for Cthulhu Invictus, it can be set at almost any time during the Roman Empire’s long history. The background to campaign begins several years before when Arrius Lurco, one of the co-owners of the Reds Racing Faction – one of the teams in the Empire’s greatest and most popular sport, chariot racing – went missing in Crete. Found a few weeks later, to this day Arrius Lurco has no memory of what happened to him during the missing time and even though he tried to resume his life, the patrician has since been plagued by nightmares and erratic behaviour. As both have grown worse of late, so have the worries of his family, their concerns coloured by the need to know the cause of Arrius’ behaviour and the need to keep it from becoming public and so shaming the house of Lurco. These concerns are only the first in serious of impediments as the investigators have to navigate both the highs and lows of Roman society in order to discover the cause of Arrius Lurco’s behaviour. Later they will find themselves at first being investigated and then harried by that cause, a sinister cult that worships Eihort, Lord of the Labyrinth, the Great Old One whose influence reaches out of the Severn Valley in the province of the Britannia across the Empire to weave itself tightly into one of the classic tales of Greek Myth located at the heart of the Mediterranean. Over the course of the campaign, the investigators need to understand the nature of the threat that they face, avoid falling into its clutches, and discover a means of defeating it. This might sound like any other Call of Cthulhu campaign, but the threat faced in The Legacy of Arrius Lurco is comparatively more pro-active, at times actively hunting the investigators. In comparison with the archetypal Call of Cthulhu campaign, The Legacy of Arrius Lurco is virtually paper-less. Few if any of its clues come as part of the traditional paper trail, forcing the investigators to talk to people and to rely on detective dog work, much like a “Film Noir” movie. In fact, the early parts of The Legacy of Arrius Lurco feel very much like “Romanorum Senium,”or “Rome Noir,” though later parts owe more to the “Swords & Sandals” genre as seen through the lens of Dungeons & Dragons. 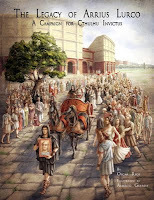 The campaign also forces the players and their investigators to explore different aspects and strata of Roman society, in particular the relationship between master and slave and between patron and client. In the case of the latter, the investigators will have the chance to establish and explore this kind of relationship. Further, the investigators will need work to establish and maintain various relationships as alliances shift throughout the campaign. The other effect of being a paper-less campaign is that the means of learning about the Mythos needs to be different. So instead of learning by ingesting great tome-sized dollops of information, the investigators must be both learned from a teacher and from experience. The aim of this is deliver the insidious information drip by drip in small, more easily digested bytes, but whilst the aim of this is to make the learning about the true nature of the universe more corrosive, in practical terms it often means that the information is delivered as less easily digested expository wedges. It is no surprise that The Legacy of Arrius Lurco weaves the Cthulhu Mythos into the Greco-Roman Mythos, it being an important facet to the Cthulhu Invictus setting. The campaign’s author goes further though, literally building its background around a well-known Greek legend before taking one more step. That step is to validate the Greco-Roman viewpoint on magic with the mechanics, so that for example, the Oracle at Delphi really can predict the future and it is possible to gain the blessings of the gods, and so on. This in addition to the various devices that are so advanced as to be akin to magic. The campaign comes with two in-built choke points. The first of these provides an intentional means of exit for one or more investigators and is intended as a point at which new or replacement characters can be introduced. As useful as this can be, the danger with it is that too many players can decide to change characters and so lose their connection with the events of the campaign’s first chapter. The second presents a challenging moral choice that forces the players to ask how far their characters will go in order to defeat the cultists. The investigators have almost no time to debate the situation in which the safest option will result in their committing a repugnant act, one whose Sanity loss is to be honest, not severe enough. Like the first choke point, this decision can be a campaign breaker, presenting too difficult a choice for some players. That said, the way in which it is presented and given the person who presents it, the choice is not at odds with the story of the campaign. In fact, it is hinted at early in that part of the campaign and the more perceptive players will likely be aware of it ahead of time. If the campaign is at times hard on the players, it also demands a great deal from the Keeper. Especially in its portrayal of some NPCs. As with any Call of Cthulhu campaign, there are many that are not to be trusted, but here there are some that need to be trusted despite their actions – actions that would in the eyes of many players damn them forever. It is possible to play around this situation, but if the campaign presents the investigators with difficult choices, it also presents them to the NPCs as well. In addition to the campaign itself, The Legacy of Arrius Lurco adds to Call of Cthulhu and the Mythos. 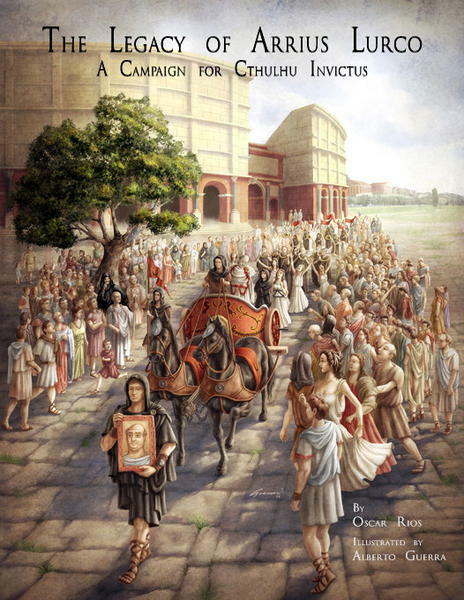 Not just developing the cult devoted to Eihort and providing it with several servitors, but also adding new spells to the game, and specifically for Cthulhu Invictus, describing five new Occupations: the Charioteer (a sports charioteer rather than the military Occupation listed in Cthulhu Invictus), the Advocate (a legal expert), the Newsreader, the Labourer, and Vigiles (primarily firemen, but also local law enforcement). Some of these actually appear in the campaign, whilst all can be chosen by the players as investigator types. Physically, The Legacy of Arrius Lurco is a cleanly laid out book with fitting artwork and solid maps that are only let down by being a little too dark to read clearly in places. It needs an edit here and there, and sometimes an index would have helped. Another problem is that sometimes references are made to sections that appear a page or two later, so that the campaign’s narrative is not always immediately obvious. Just as with Our Ladies of Sorrow, its modern set campaign for Call of Cthulhu, Miskatonic River Press has produced another campaign that showcases what is possible to do beyond the game’s beloved campaign archetypes. In particular, The Legacy of Arrius Lurco showcases what is possible with the Cthulhu Invictus setting, emphasising its strengths and differing approaches to delving into Lovecraftian investigative horror whilst also exploring the setting itself. The campaign is not without its faults, but those really derive from strength of the material and the demands it makes of players and Keeper alike – be warned this is not a campaign for the timid or for those who prefer their games not to be too challenging. Ultimately, The Legacy of Arrius Lurco is exactly the kind of support that not only Cthulhu Invictus, but also Call of Cthulhu should be getting, setting the standard by which all future Cthulhu Invictus releases will be measured. Thanks for the review. Definitely sounds interesting.